I like the delicate squiggles, the spacing and the light cross hatching in this sketch. It has a coincidental resemblance of a Joan Miró composition. But Miró planned his work. I did not plan the visual look of this drawing but rather followed a manual procedure. My process was to create a uniform spacing of irregular lines. If I had continued the drawing to its natural limit, the entire paper would be a field of gray, or entirely black. I cross hatched along some of the curved lines, varying directions, creating different planar surfaces. The final flourish was filling in a tear-drop shaped form with red. 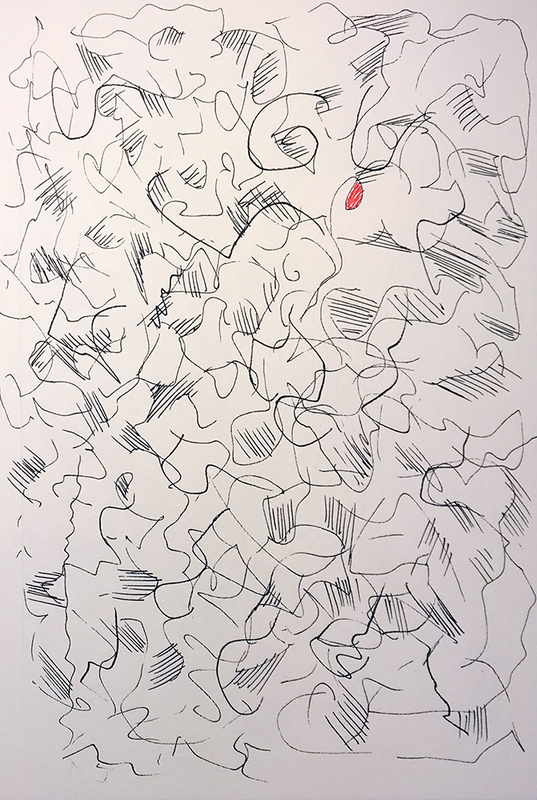 This entry was posted in Personal Stories and tagged abstract art, art, artistic process, creative process, creativity, drawing, free form, Joan Miró, sketch, visual art. Bookmark the permalink.